Removing cat sick from your carpet – okay we agree, it’s not the most enticing blog! However, for any of you that have a cat, this article could prove useful. 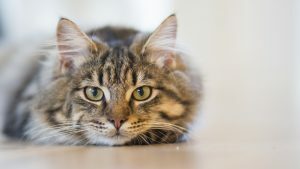 Our cat Ella happened to be sick all over our hall carpet the other day; so we thought we’d share with you some tips on how to deal with such a mess! Without trying to make you feel queasy, the first thing you need to do is remove any lumps and excess spillage that is sitting on the surface of the carpet. A spatula is a great tool with which to do this!! Once you’ve dealt with the excess, you need to get yourself a damp cloth. Dab the area with the cloth. DO NOT rub as this can damage the fibres and ground the spill further into the carpet. Now use a dry cloth to dab as much as the moisture away as possible. Now just leave the area to dry naturally! You may still see signs of a mark until the carpet has fully dried. However, please resist the temptation to interfere with it! In the majority of cases, you will find that the area looks much better by the morning! If you have a dog or other animal and they happen to be sick, you can use this same method! What if there is still evidence of a stain? Please don’t be tempted to raid the cupboard under your kitchen sink for cleaning products. These can actually make things a lot worse! Furthermore, if they aren’t full rinsed out, they can leave a residue which can attract dirt and result in future stains! If you find the stain late in the day and it’s already dried, it can be tricker to remove. If this is the case or if the above method doesn’t work, then give Careclean a call for advice or to book a free cleaning quote on 01245 323989. You can find out more about our carpet cleaning services here. Careclean was established in 1984 and has a vast knowledge of carpet and upholstery cleaning and maintenance. We post a bi-weekly blog, which often includes carpet and upholstery cleaning tips, guidance on keeping your home clean and healthy, and offers and competitions. Click here to check out our blog. You can also follow us on Twitter and Facebook to keep up to date on all the latest news and offers.